What precautions should I take while hanging objects with HELPYhook TM ? As is the case with all hooks, it is necessary to use basic precaution while using HELPYhook TM . Since the hook has sharp points, keep HELPYhook TM away from small children, as you would do with nails, screws, etc. Use caution when pulling HELPYhook TM from the wall or pushing it to the wall. Store unused HELPYhook TM in the container provided in a safe place. Use caution while handling fragile and valuable items. Also, donot hang objects directly above anything that can be damaged, in case the object falls. What objects can I hang using HELPYhook TM ? HELPYhook TM is designed to be strong and reliable. Most objects such as picture frames, clocks, mirrors, decorative plates, keys, bags, coat hangers, etc. can be hung using HELPYhook TM . Please see sample videos on Youtube and examples on website. What is the load carrying capacity of HELPYhook TM ? If the quality of the drywall is good, HELPYhook TM can hold its maximum capacity of 17 lb / hook, for objects that hang vertically down along the surface of the wall. The hook should be fixed flush with the wall. If the object extends away from the wall (i.e. bulges away from the wall), the load carrying capacity will be reduced and the hook may be pulled out of the wall. For instance, if you are hanging bulging bags, heavy pots etc. the load carrying capacity will reduce significantly. In general, farther the center of gravity of the object that is hung from the hook, the lower the capacity. Use caution while hanging objects that extend away from the wall. Can HELPYhook TM be used on any wall? HELPYhook TM is designed to be used on a Drywall (plastered Drywall). The type of drywall may vary in hardness. However, users in Europe have used HELPYhook TM even on soft wood (may require tapping with a mallet or hammer). 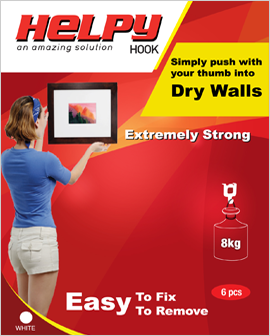 We do not recommend HelpyHook for very old walls, which may have more plaster and can be harder. Why is it that in certain areas of a drywall, HELPYhook TM can be easily pressed with the thumb, but in other areas it is more difficult. In most locations in a home or office, HELPYhook TM should be easy to fix on to the drywall by pressing with the thumb. In areas where the drywall surface is directly on the wood or steel frame, or near a door frame, it may be necessary to tap HELPYhook TM on to the drywall, by using a mallet or a light hammer. Yes, HELPYhook TM is removable with a flat screw driver. Gently push the hook away from the wall from the top. The hook can be reused. HELPYhook TM is easy to fix and easy to remove. How can I increase the load carrying capacity of HELPYhook TM ? For heavier items, it is recommended that you use 2 HELPYhook TM as shown below. Daisy chaining 2 hooks for heavier objects. Using 2 HELPYhook TM divides the weight and supports heavier objects. How can we contact you for our specific needs? Please send us an email: helpyhook.contactus@gmail.com We will be happy to support you with your specific needs. It will be helpful if you can send us a photograph of the object you are planning to hang. Where can I buy HELPYhook TM ? You can buy HELPYhook TM on amazon.com, walmart.com, homedepot.com houzz.com and select Ace Hardware retail stores.